We’d love your help. 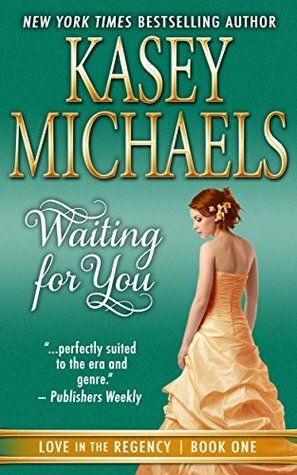 Let us know what’s wrong with this preview of Waiting for You by Kasey Michaels. Jack Coltrane grew up with his father’s red-haired tomboy ward Meredith Fairfax chasing after him, always begging to tag along in his adventures during the years they resided at Coltrane House. Jack was variously annoyed, flattered, and as the years passed and childhood faded, both he and Merry sensed a slow change in their relationship. Friendship, blossoming into love. Love for each other, and a combined love for Coltrane House, fast falling into disrepair by his neglectful father. But one day the estate would be his, and Jack and Merry would make it beautiful again, raise their children there, and live happily ever after. Theirs was the perfect dream, until Jack’s father took him aside to tell him something that sent his son fleeing from Coltrane House, away from Merry, perhaps never to return. Ah, love… why is it never easy? Having read more than one of Kasey Michaels's offerings this one started out very well but began to soon unravel in my opinion. The abbreviated synopsis: Young hero is the son of a lazy, cruel, and profligate nobleman and grows up with the heroine, a ward of the manor house owner. The son is forced into a wedding to the heroine so the evil nobleman can gain access to her fortune. The son is thereby shamed, threatened, and sent away, seemingly forever. The young heroine waits five long years for h Having read more than one of Kasey Michaels's offerings this one started out very well but began to soon unravel in my opinion. The abbreviated synopsis: Young hero is the son of a lazy, cruel, and profligate nobleman and grows up with the heroine, a ward of the manor house owner. The son is forced into a wedding to the heroine so the evil nobleman can gain access to her fortune. The son is thereby shamed, threatened, and sent away, seemingly forever. The young heroine waits five long years for her 'husband' to return to her. When he finally does there is an interminable period of love/hate that ping-pongs back and forth between the two that drags on way too long for this reader. The funds for the manor are mysteriously disappearing and the life-long bookkeeper is suspected. There ensues a plan to regain the manor from crushing debt and the hoped-for reconciliation of the two resentful and angry lovers. The author's strong point is her use of humor, which is well-developed. However, toward the middle point, it began to drag and be overly-drawn out for me. As a reader, I would have enjoyed it much more if at least 100+ pages could have been eliminated from its 400+ page length. The introduction of ghosts at the mid point also spoiled the serious nature of the romance for me. 3.5, rounded up. I count on Kasey Michaels to give me a gently humorous story with characters who are endearingly flawed. This did not disappoint. Surprisingly, the paranormal with Bard quotes wasn't a deal breaker. This has a decent enough premise - the first few chapters cover Jack's early life when Meredith is just a baby in August Coltrane's house. August is a drunk and a gambler, who returns to the county estate at infrequent times during the year to throw raucous house parties. Though various methods, Jack and Merry are brought up by a random troupe of people, including two actors, a tutor, a viscount, and various other people. The story zips along at 5 year gaps as Jack and Merry grow up, ultimately being forced to marry, when she is 16, in order for August to get hold of her money. That same night, Jack escapes, fearing his father would beat him again - this time to the death. He returns 5 years later, certainly richer, but not necessarily wiser- with his father and some of those who looked after Jack when younger, now dead. He finds Merry both loves him and hates him. Henry Sherlock, a friend of his fathers, has been running the finances of the estate in Jack's absence, whilst Merry has been running the estate and trying to pay off all the debts. Clancy and Cluny - the two actors - are now ghosts keeping an eye on Merry. The rest of the book is spent with Jack and Merry trying to work out their emotions and a way forward - bearing in mind they are still technically married to each other, dont really know each other as adults and have been damaged so much since they were children. Jack also comes to realise that Henry Sherlock isnt as benign as he lets on. There is also the matter of the Highway man who has started robbing people mere days after Jack has returned to town. There's a lot of plot, a lot of talking (much of it resulting in the book getting a little bogged down in parts). The use of the ghosts as a plot device was good, though not sure if it could have worked some other way. Much of the other matters - such as embezzlement, fraud and forensic accounting - could be seen as very modern for a regency period book. 3.5 stars. Merry has been the bright light in Jack's beleagured childhood - one he's spent hiding from his brutal and debauched father, and loving and taking care of Merry, an infant when she became his father's ward. Clancy and Cluny, a couple of Irish travelling Shakespearean actors arrive to entertain a house party and never leave as they fall in love with the children and decide to help bring them up. Merry has loved Jack for ever, but he can't reconcile his attraction for her with his belie 3.5 stars. Merry has been the bright light in Jack's beleagured childhood - one he's spent hiding from his brutal and debauched father, and loving and taking care of Merry, an infant when she became his father's ward. Clancy and Cluny, a couple of Irish travelling Shakespearean actors arrive to entertain a house party and never leave as they fall in love with the children and decide to help bring them up. Merry has loved Jack for ever, but he can't reconcile his attraction for her with his belief that he should feel for her as a brother. Through a series of unfortunate events Jack and Merry find themselves married and Jack exiled. Many years, and his father's death later, Jack returns with his enigmatic American Indian partner Walter in tow, now rich, to find the estate flourishing, the house falling to bits, Merry as estate manager, Clancy and Cluny gone, his father's business manager now a wealthy neighbour and his best friend Kipp in love with Merry. And Merry has no time for Jack, deeply hurt by his desertion, continued absence and lack of communication. Yet she won't divorce him. With some spirited help from Clancy and Cluny, devoted friendship from Kipp, forensic accounting by Walter and Jack, a mysterious highwayman is caught, embezzlement identified to source and just desserts meted out. For a lovely HEA. Overall good read, slow in spots. was slow and plodding in places and I found myself skimming to find better content. As writer myself, I find that spelling errors in e books occur frequently, grammar and syntax are sacrificed to speedy publication. Historical Romances should not be formulaic, but should be Overall good read, slow in spots. was slow and plodding in places and I found myself skimming to find better content. As writer myself, I find that spelling errors in e books occur frequently, grammar and syntax are sacrificed to speedy publication. Historical Romances should not be formulaic, but should be consistent, as Kasey's books usually are. This one fell a little bit short of being really good. I wanted to test my Kindle App and the book happened to be a free offering that day. Unfortunately, it was a waste of time. I'm not inclined towards melodrama in general, and I do prefer a wittier heroine and more of an alpha male character in a Regency. I might have given it 2* but the ghosts dropped the rating further. I believe they were supposed to provide some comic relief, but instead they felt awkward, annoying and completely unnecessary. This story has a little bit of everything! This story is at times suspenseful, at times heart rending, at times sad, but underlaying it all the love between the characters makes you root for them. I loved the Shakespearian quotes and the Bard's actors, especially in death. Lots of twists and turns, with many surprises, but overall a delightful story. For what is home but where the heart is. A very poignant story of two people finding their way in a world of difficult times and with no family to help. Creating their own family and living. Having a variety of people to help them and love them. That's what you will find in this story. Very good read. Light on sensuality & romance, and heavy on the plot. There's a bit of paranormal in it, and while I don't usually go for that sort of thing, it did help move the story along somewhat. I've been a Kasey Michaels fan a long time. I've never read one of her books I didn't enjoy. Intelligent, sympathetic character's, well plotted with action, suspense & humor. And the Regency Period always provides an interesting backgroud. Another fine Regency romance by Kasey Michaels. I read the second volume first, and although they're stand alone, it was great to meet Merry and Jack, and the giant Indian. Lazy writing - talking to oneself used to disguise exposition. Weird use of secondary characters, an excuse to spout Shakespeare? This review has been hidden because it contains spoilers. To view it, click here. No babies at the end of this book, but it was a pretty good read. It was a little confusing-the whole ghost thing-but I managed to wrap my mind around it towards the end. Slow read. I had trouble finishing the book. There were parts that I like, but a lot of it was just too much detail and little romance. Love the author but this is not one of her best. Convoluted plot and somehow it couldn't keep my interest. Missing the liveliness of other works. um... it was pretty bad. by far the ghosts were the worst part, but falling into bed with someone you had changed diapers on without much of any foreplay was also bad. Well-written, for the most part, but it got off to a slow start and the romance wasn't as prevalent as I would have liked. Romance, intrigue, scoundrels, orphans, and even ghosts. This book had all of it. I enjoyed reading this one and would read more of these Regency books - this was book one. Enjoyed the story. And the ending - loved it! Was almost in tears! Cluny and Clancy stole my heart.